Social media marketing remains a powerful and proven way to share and distribute quality real estate content that helps you connect with prospects and generate new business. 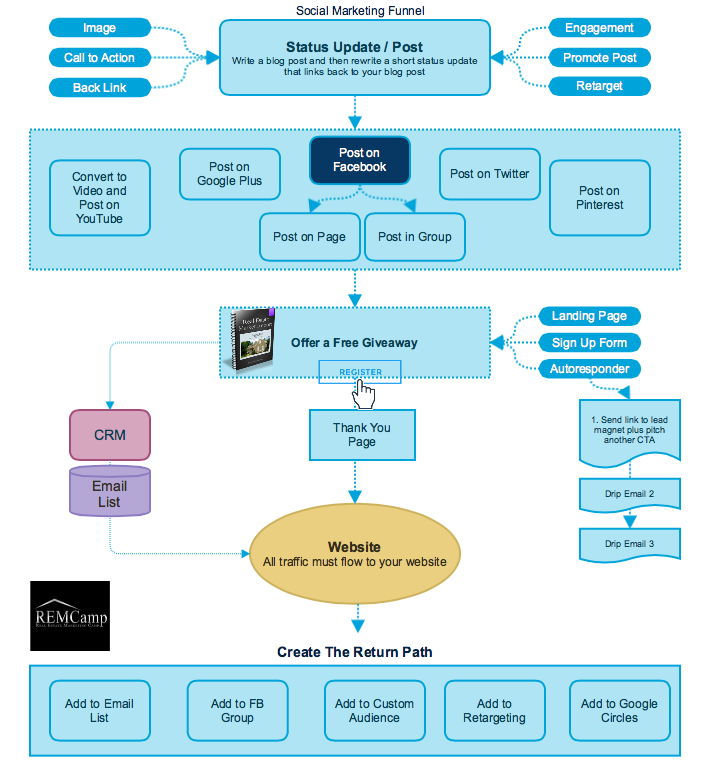 To help you distribute and promote your posts and content we created a social media marketing flow chart that gives you a step-by-step blueprint to follow for every post. Every time you write a blog post or publish content you need to rewrite a short version of the post as a status update. Make sure you customize the status update for the social network and don’t just copy and paste the first paragraph of the post. Use the post to encourage engagement like comments, likes and shares. I like to backlink each status update back to the original post on my blog. This tactic is designed to drive traffic out of the social network and back to my blog or website. I want to move the reader into my environment where I can position myself as a local real estate expert and try to convert the visitor into a contact by getting his or her contact details. The best way to convert a visitor into a contact is to give away free expert real estate content that requires the visitor to fill out a web form and give you his or her email address. The final step is to create a return path to your new contact by adding his or her email address to your newsletter, email lists and paid retargeting advertising campaigns.